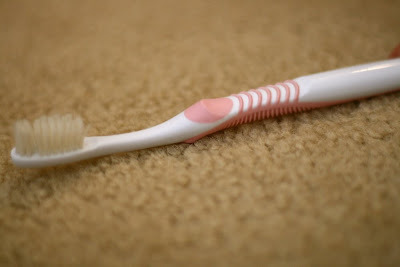 the gardiner's dirt: "Where is my toothbrush?" Eric asks me this every evening. I always know where it has been. But never the current location. What's even better is that Eric has a pink toothbrush. eeeeksss i hate when mercer gets mine. im bummed we cant put locks on the cabinets in our new bathroom. I love how her hair gets lighter it seems like in every new picture! 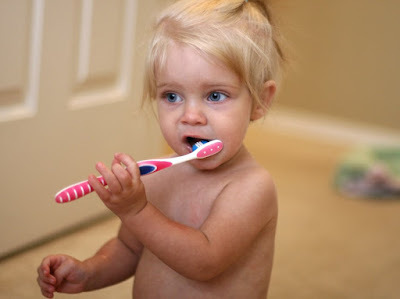 seems like everyone in your haouse has a pink toothbrush. 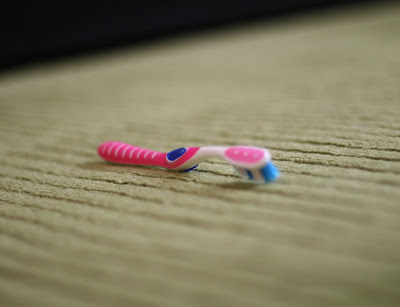 Yeah, we have a toothbrush scavenger as well- I keep having to buy Matt new toothbrushes because somehow his keep ending up in the garbage. I have found shoes, sippy cups, bottles, binky's, etc. in the garbage and the laundry basket. I think Mia watches us put stuff in there and she loves to "put things away," so I find really disgusting sippy cups on laundry day. Or realize I only have one of my favorite shoes left. Ah, toddlers. The cute thing is DEFINITELY a defense mechanism. I don't think I'd be as loving if Aaron was the one throwing my shoes away! She is a cutie...I can't believe how blonde her hair has gotten!! Mae is officially a blonde. I can't believe it! When she was born I never thought I would see the day. She is such a cutie, dark hair or blonde.